The refrigeration cycle uses four essential elements to cool. The system refrigerant starts its cycle in a gaseous state. The compressor pumps the refrigerant gas up to a high pressure and temperature. From there it enters a heat exchanger (condenser) where it loses energy (heat) to the outside, cools, and condenses into its liquid phase. 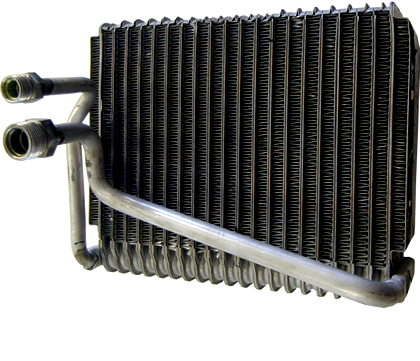 The liquid refrigerant is returned to another heat exchanger where it is allowed to evaporate, hence the heat exchanger (evaporator). A metering device regulates the refrigerant liquid to flow at the proper rate. As the liquid refrigerant evaporates it absorbs energy (heat) from the inside air, returns to the compressor, and repeats the cycle. In the process, heat is absorbed from indoors and transferred outdoors, resulting in cooling of the interior of the vehicle.